Experience the True Arizona in Cave Creek - eclectic shopping, art galleries and the unrivaled beauty of the Sonoran Desert. More than 30 restaurants to choose from, everything from fine dining to cowboy cook-outs. Horseback riding, rodeos, country and western dancing, museums, parks and nature preserves, hiking and biking and old mining tours. Rancho Manana: Located in historic Cave Creek, is the golf community of Rancho Manana. This beautiful community boasts extraordinary views and unspoiled desert terrain. The par 70 18-hole golf course was designed by Bill Johnston & is open to the public. Homes range in price from $400,000 to $1,000,000. Within this wonderful community is the Tonto Bar & Grill with an elegant but rustic ambiance and delicious food. Dine indoors in a elegant yet rustic ambience or on the outside patio, facing the 11th green. Dove Valley Ranch: An 850 acre master planned golf community. 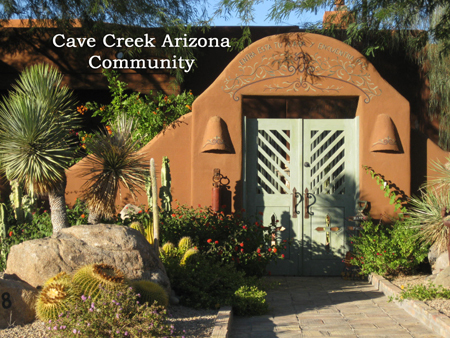 Conveniently located in Cave Creek near the SW corner of Carefree Highway and Cave Creek Rd. There are several small neighborhoods within the ranch. Some are gated. There are 706 homesites. Homes sit on nice sized lots as apposed to other master planned communities in Cave Creek. The golf course is public. Robert Trent Jones designed the 18 hole course. Desert Willows Elementary School is located within the Ranch. Click here for more Features & Services at the Luxurious Carefree Resort & Villas. CodeRed® is an emergency telephone notification service that, when activated, will dial subscribers with a recorded message describing the nature of the emergency, actions the Town is taking to alleviate the emergency and recommendations for measures citizens can take to ensure their safety during an emergency. The newest addition to Maricopa Countys Regional Parks System, the conservation area encompasses 2,154 acres of diverse, rugged upper Sonoran Desert. The north Valley location contains fascinating archaeology sites and lush riparian areas along Cave Creek, which flows throughout the winter months. Remnants of early mining and ranching, from which the park gets its name, are still apparent in the park. This area is a must see for all wildflower lovers in the spring. The abundant vegetation present in the conservation area provides a rich habitat for a diverse assemblage of wildlife. About CCFAF: Our Mission is to Promote, Celebrate and Fund Film and the Arts by Establishing and Funding the Cave Creek Film and Arts Festival.